Along with almost 3,000 lives, it is thought that over $100m of artwork was also lost on the tragic day of September 11 2001. The day of 9/11 is one that not only shook the United States, but one that shook the world. It saw the loss of almost 3,000 lives and two of the worlds most iconic buildings wiped from the New York skyline and reduced to rubble. However, tens of thousands of records, irreplaceable historical documents and works of art were also lost in the attack. And over a decade later, it is still unknown exactly how many artefacts were destroyed, making it hard to piece together much missing history. Although, miraculously some sculptural pieces of art survived the collapsing inferno. One of which has recently been returned to the World Trade Centre site, to serve as a memorial to the victims of 9/11. The Sphere, a sculpture that was originally commissioned for the World Trade Center, by Fritz Koenig, stood between the Twin Towers in Austin Tobin Plaza from 1971. The 25 foot high bronze sculpture, which sat atop a ring of fountains, was designed to symbolise world peace through world trade, and rotated once ever 24 hours. It was beautiful focal point of the plaza, where many of the 50,000 workers of the Twin Towers as well as the 200,000 daily visitors would come to meet with friends enjoy their lunch and take photographs. 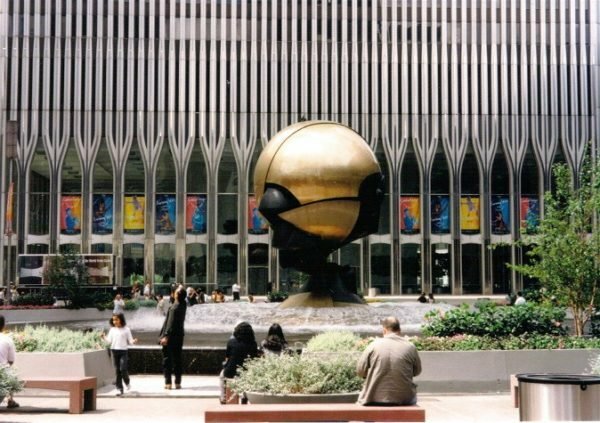 After the September 11th attack in 2001, the sphere miraculously remained mostly intact. It protruded from the wreckage, battered and scared, but was one of the only recognisable structural remains among the tonnes of rubble. The rescue efforts continued day and night for the days that followed, but 3 days after the attack the final survivor was pulled from the wreckage. As the search for life ended, attention turned to the clear up of the hazardous site. In the months that followed The Sphere had an uncertain future, it was placed in a hanger next to JFK Airport, where it sat for many months before it was decided that it would not be repaired, but instead would serve as a symbol of the indestructible spirit of America. In 2002 it was temporarily moved to Battery Park, alongside an Eternal Flame which was created as a memorial to 9/11 victims. After much debate, the sculpture has now been moved to Liberty Park where it overlooks its original location. The unrepaired Sphere offers contrast to the tranquility of the 9/11 Memorial plaza, serving as a potent reminder of the devastation of that day. Slightly set back from the 9/11 memorial itself, it once again serves as a spot where passers by can spend 5 minutes to rest their legs, enjoy their lunch and meet with friends. “IT WAS A SCULPTURE, NOW IT’S A MONUMENT. IT NOW HAS A DIFFERENT BEAUTY, ONE I COULD NEVER IMAGINE. IT HAS IT’S OWN LIFE… DIFFERENT TO THE ONE I GAVE TO IT. Our permanent base in the United States is a chic and elegant gallery in the heart of Manhattan Island, New York. Close to Madison Avenue, our prime location keeps us at the epicentre of the city’s prominent and ever-changing art market.